Here it is! The finished pattern for The Bainbridge Scarf. It even includes step-by-step directions for wearing it. I want to get the pattern up right away, so a proper pattern page is still forthcoming (plus, it’s been a long time since I uploaded a new page to the site, and I’m going to need some time for my memory to kick in). Click on the name below in the meantime. Enjoy! As always, if you make one I’d love to know about it–send me photos, and that elusive “reader’s gallery” that I’ve been talking about forever will eventually see the light of day. Don’t hesitate to email me if the pattern is confusing or you’re having problems (mintyfreshflavor at gmail dot com). i love it! i will definitely be making one of these. Lovely! And just in time for the cold spell too! That is really lovely!! Nice work! Very cute, thanks so much for sharing the pattern. I think it’s intriguing. I look forward to checking out the pattern! Good job! this is so cool! i love neck warmers! awesome! thanks for creating a pattern. i was going to try and figure it out myself but i’m so glad you did it for us. Such a great construction! I love the way it turned out, E! Great scarf! 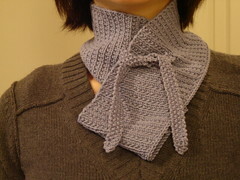 Pefect neck warmer and just in time for all the copd weather. I’ll have to wip one up. Looks like another great Pepperknit creation. Yay! I’m glad you decided to write up the pattern :). I can see this making wonderful gifts for next year. thanks for shaaring this great pattern! i can’t wait to make one! Love it! Am already peeking through the stash for appropriately soft yarn. I totally love it and I’ve saved the PDF. Very well written pattern, and excellent how-to photos. And I even have the yarn in my stash, so I don’t have to break any resolutions to make it! Hi — I came over from knit n lit to see your scarf. Congratulations on finishing something for you! :) You did a great job. I saw your scarf on someone’s blog (they had just completed it) and I wanted to tell you how cute it is! Thank you for sharing the pattern, I can’t wait to make it. I just finished your my first bainbridge scarf, it’s really great! Although I should’ve used a other yarn, something less-itchy.. Anyway, I just wanted to say, that I’ll put a link on my blog to this pattern. What a great scarf. Can you get it added to Ravelry so I can keep track of it? I concluted my first bainbridge scarf, it’s very cute! Thank you for sharing its charming pattern. Thanks so much!!. I love it!! Thank you for your cute and easy pattern. If you want to see myscarf it is on my blogspot. Thanks I love it. Can guys wear it? so cut ! I will put it in my blog, thanks so much for the pattern ! I knit this scaf for my mother’s birthday. Thank you for this great pattern ! I want to try this…and am at a loss on how to join to work in the round. Help! I love the look and want to make one for each of my granddaughters. Thanks! I hope to make a bunch of these for xmas.